I’m a Growtopia Youtuber but I also like to create Minecraft Mods and Texture Packs. I’m currently 16 years old and my birthday is 4th of January. I also play alot of games and you can see my IGN’s by pressing here or pressing “Game Profiles” in the menu. How did you get the name WoodCollector? My friend was going to have a LAN birthday party a few years back. Instead of buying a present to him we all had to buy our own Minecraft Account to be able to play at the party. I like to collect things and I’ve collected many things such as Pokémon cards, pastille boxes and bottle caps, so I thought my name should be something with “collector” in it. I also wanted to make it Minecraft themed. I tried many different names like DiamondCollector, GoldCollector, CoalCollector, StoneCollector. Some of them were taken and after awhile I chosed WoodCollector. And I’ve been using the same nametag for almost every platform since. Before I was called WoodCollector I called myself, “Fiskben” and “GameAndCola”. From the begging all I really played was Minecraft. I enjoyed playing a gamemode called “Hunger Games” and I liked PvP aswell. I also got very famous at the biggest Swedish Minecraft server at the time. Then I made a Steam account and started playing Counter-Strike: Global Offensive. Later on I found the game Growtopia. Today I’m playing all of theese games. Just a little fun fact. 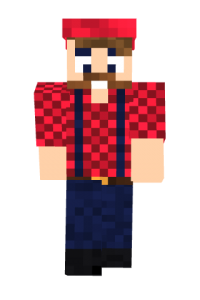 I’ve almost always used the same skin in Minecraft. 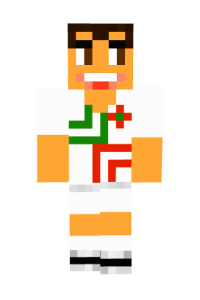 (This one) It’s supposed to look like Christiano Ronaldo when he played for Portugal in EM 2012. But I changed it when I got my logo so it would match it. Read more about all of my accounts by pressing here.